I’ve been working with WordPress for years now, and I thought it might be a good time to start sharing my knowledge of WordPress best practices. One item that I think a lot of people just getting started using WordPress might find handy is how to build a navigation that is driven by pages. Having a navigation driven by pages has numerous benefits, including having the nav written out as an XHTML compliant unordered list, being able to include or exclude any pages you’d like, being able to sort the list items to your preference, and being able to style the current page’s nav button differently. The first thing you need to do to setup a nav driven by pages is create the pages themselves. The title you give the page will be the text that appears in the nav. Also note that by default the nav items will be sorted alphabetically, but you can prioritize them setting the “Order” field from within each individual page. The above block of code includes an opening php statement <?php, the function call wp_list_pages('');, and the arguments to be passed to the function include=2,7,9,11 and title_li=. Let’s take a look at the two arguments I passed to the wp_list_pages function, starting with include=2,7,9,11. This tells the function I’d like to include only pages with the id’s of 2, 7, 9 and 11. To find the page id’s that match your specific pages, go to your pages>edit screen and hover over the link for the title of the page, and (if you’re using Firefox) look at the bottom of your browser. At the end of the link you’ll see something like post=7. The number here is your page id. Plug in the page id’s for any pages you’d like to include, and you’re good to go! The other argument I pass to the wp_list_pages function is to remove the title that would appear by default. By passing title_li= you’re essentially saying “set the title to blank”, and the function does not return a title list item. Generally you won’t want the title, which is up one level in the document tree, to appear if you’re making a navigation that you’ll end up floating to the left with CSS. The ampersand between the two arguments just allows you to string together multiple arguments. You can string together as many as you’d like to further develop your own custom WordPress queries using any of the further options detailed on the WordPress.org wp_list_pages template tag page. The last, and probably most worthwhile thing about building your nav in WordPress using pages is that while navigating your site, the list will be auto-updated with a class that allows you to style the current page’s button to look different than the other nav buttons. After you’ve got your nav set up and working, visit one of the pages and then view the page source. You’ll see the class of current_page_item applied to the list item for the page you’re currently on, automatically generated by WordPress for each page. Now just start styling your way to a dynamic WordPress page-driven navigation! If you need more info on the CSS required to float a list to the left that creates a horizontally oriented navigation out of an unordered list, check out this tutorial at 456 Berea St. I hope this can help you to build your own navigation, and take it even further using the WordPress.org template tag page. This entry was posted in Tutorials, WordPress and tagged WordPress, wordpress navigation, wordpress pages, wp_list_pages on May 16, 2009 by Jeff Pelletier. The popularity of regular expressions has everything to do with how useful they are, and absolutely nothing to do with how easy they are to use – they’re not easy at all. In fact, to most people who encounter them for the first time, regular expressions look like something that might eventuate if you fell asleep with your face on the keyboard. Fantastic! There are a number of moments like this that brighten up the pages. So right about now I’m wishing that if I could be anywhere, it would be at SXSW (South by Southwest). For those of you who don’t know, its about the coolest festival on the planet. And I don’t know from experience, just from colleagues and coworkers and podcasts and industry moguls giving me an earful. In addition to being a hotspot for web design, SXSW boasts an impressive musical lineup each year, and this year I’ll be disappointed that I’ve missed The Everyday Visuals, Madi Diaz, and the undisputable heavyweight of soul, Miss Erykah Badu. I’ve been hearing about it for weeks, from Paul Boag blabbering about it on his Boagworld podcast, to having to postpone projects with colleagues who are attending, to CSS guru Eric Meyer tweeting, “If you’re not going to SXSW, tweet like you’re there. Nobody will know the difference.” Yeah, that almost makes up for not being able to attend. But alas, I am not one to linger, and the time spent here at home has given me the opportunity to start exploring jQuery, which was recommended to me by Alex King, famed author of the WordPress Popularity Contest plugin, and another item that Paul Boag has been going on endlessly about for months now. I finally broke down and downloaded the library and started playing with it. Second, I was really impressed with the quality and quantity of documentation. Compared to Prototype, jQuery blows it out of the water in terms of a working online manual. I think I’ve officially moved the “Prototype and script.aculo.us” book to the back of my “must read” list. I’ve actually read the first half of it already, but it was cryptic and would have required re-reading on my part to fully absorb the material. jQuery is the complete opposite. There are video tutorials explaning the beginner steps. Video tutorials. The last thing about jQuery that really hooked me was the ease with which a web designer can pick up the library. A lot of the arguments you pass to the library are the same as in CSS. So if you’re looking for a div with the id of conference, you pass (“#conference”) as the argument. It seems like its going to be really easy to quickly get up to speed with the library, and that it has a lot of power in terms of what you can do with it. If you’re interested, check out the jQuery site, the jQuery UI site, as well as some of the video tutorials. Really, really, really cool stuff. I’ve run through this process a few times now, so I thought I’d document my steps for anyone who’s interested in setting up the multi-user version of WordPress on their local box for testing purposes. The power of the multi-user version of WordPress is impressive, especially when combined with BBPress for forums, and the teetering-on-official-release BuddyPress for social aspects. Ready to dig in? Lets go. The first thing you need to ensure prior to installing WordPress MU locally is that you have the underlying technologies installed. WordPress and WordPress MU run on LAMP, or in this case MAMP. There are all-in-one packages out there that install all three for you, and OS X does come with versions of Apache and PHP, but we want to learn how to get our hands dirty and be able to fix anything ourselves in times of crisis, right? So we need to make sure you’ve got Apache running, MySQL installed with a dedicated database setup, and PHP installed. First, we’ll tackle Apache. This sentence will probably take longer to write than it will for you to turn on Apache on your Mac. Go to System Preferences > Sharing > Web Sharing. Checking of the “Web Sharing” checkbox here toggles the Apache server. If you ever need to restart Apache, its as easy as coming in here, unchecking the “Web Sharing” checkbox, and checking it again. Cake. On to MySQL. You’ll need to download the most recent version of MySQL, which can be found at the MySQL downloads page. Click “downloads” under the MySQL Community Server section. Scroll down to the “Mac OS X (package format)” link and click. Here is where you’ll have to ensure you download the proper package based on your Mac. I chose the 10.5 (x86) since I’m running an Intel MacBook Pro, which ias the x86 processor. After you determine which package suits your Mac, click the “pick a mirror” link, and if you’ve never downloaded anything from the MySQL site before, you’ll have to register quickly. Once you’ve registered and downloaded the dmg (named mysql-5.1.31-osx10.5-x86.dmg in my case), you’re ready to run the installer. Once you’ve opened the dmg, you’ll see two .pkg files we’ll be interested in. First, run the installer pkg file, which will walk you through a simple install. After the initial install you’ll want to launch MySQLStartupItem.pkg, which will ensure that MySQL starts each time you restart your Mac. You’ve now got MySQL installed on your Mac! Note the install location, as we’ll need that later on to create the database for WordPress MU. Mine installed at /usr/local/mysql/bin/mysql. Another item worth mentioning is that working with MySQL, PHP and Apache requires you to have access to a lot of OS X’s hidden files. I recommend a great OS X app called FileXaminer, which I read about in MacWorld a while back. FileXaminer lets you browse all the hidden files in Finder, and chmod the permissions on files and folders directly from Finder, rather than the command line. Definitely a great solution for 10 bucks. The final piece of our MAMP stack is PHP. PHP installation is fairly straightforward, and the best package online is located at Entropy’s PHP download page. There’s a box on this page titled “PHP 5 on Mac OS X 10.4, PPC and Intel”, and you can select the “PHP 5.2.4 for Apache 2” package. Its definitely worth reading through this page first, but most users will have the default setup of Apache, and won’t need to make any changes prior to running the install. After running the entropy installer, you can run a test to make sure everything went well. Create a file titled test.php, and stick the following code in it: <?php phpinfo() ?>. Put test.php in your /Sites folder (/Users/yourusername/Sites), and then open up http://10.0.1.2/~yourusername/test.php. The IP used in this example is found in System Preferences > Sharing > Web Sharing. The phpinfo function is a great way to quickly check all the settings of your PHP install, so save this test file for reference in the future. There’s one final tweak to PHP that’s really a best practice. You’ll want to navigate to your php.ini file, and open it in your favorite text editor. My php.ini is located at /private/etc/php.ini. Make a duplicate of this file (sometimes the original will be called php.ini.default, so make a dup called php.ini). Once you’ve opened the php.ini file, search for “register_globals = On”, and switch it to register_globals = Off”. Also, search for “magic_quotes_gpc = Off” and switch it to “magic_quotes_gpc = On”. In the php.ini file, all lines that start with a ; are commented out, so you’ll want to search for these two lines that are not commented out and then make the changes. Save the changes in php.ini, then restart Apache in System Preferences. Then open your test.php file again, and look for the changes to make sure they were made. Finally, its time for the money melon. Download the latest version of WordPress MU from the download page. Unzip the package and stick it in your /Sites directory, and rename (I chose “wpmu”). The first thing you’ll want to do before attempting to install WordPress MU is to open the README.txt file that is in the root directory of the unzipped WPMU package. You’ll want to read this carefully and cater the specific files you your specific install case, but they basically touch upon the php.ini file that we’ve already edited, and the httpd.conf file, which is Apache’s root config file. I found mine located at /private/etc/httpd.conf. You can find a better understanding of the Apache httpd.conf file, the directives contained within, and an explanation of the .htaccess files you can use to override the httpd.conf file in your local sites at the Apache web site. I found that after reading a few short pages here, that the Apache config file cascade is very similar to the cascade of CSS files and rules. Cool stuff. where wpmu is the name of the database. You can name the database whatever you’d like, but make sure to follow it with the semi-colon, and remember the name of your database. You can now open the index.php from your wpmu folder in your web browser. It may tell you that you have to change the permissions on a few folders prior to running the install. If this occurs, it is extremely easy to modify the permissions using FileXaminer. The two folders you’ll have to mod are the root /wpmu folder and the /wp-content folder, changing the permissions on both from 755 to 777. After you’ve made these changes, refresh the index.php file, and enter the proper information. and resaved the file. Also note that I set the database location to “localhost.localdomain”. The other information on the install screen should be pretty simple; the database name and password we just created in MySQL. Once you’ve filled out the form, submit and you should be looking at a nice, fresh, local install of WPMU. If you do get stuck, the WPMU Forums are a big help, as most likely users have run into your same problem. The steps above worked for me, but there may be variables with your certain configuration that you’ll need answered in the Forums. Good luck, and happy WPMU’ing! UPDATE 3/4/09: If you’d like to configure OS X Leopard to host multiple local WordPress instances, follow this great tutorial at O’Reilly. I’ve spent hours piecing together solutions from various articles, but this O’Reilly article sums it up great. Basically, I’ve now got WPMU running locally at test.wpmu.local, and WordPress running locally at test.wp.local. Apache’s Virtual Hosts are really powerful, and essential if you’re going to be working on multiple client websites that run on WordPress. This entry was posted in Tutorials, WordPress, WordPress MU and tagged apache, bbpress, buddypress, install, mysql, php, WordPress, wpmu on February 28, 2009 by Jeff Pelletier. Web Standards Solutions: The Markup and Style Handbook is just that: an essential guide and reference that builds upon the theory presented in Jeffrey Zeldman’s Designing with Web Standards with real-world practices. Dan Cederholm is a designer working full-time in the field, and he presents practical and easily understood examples in a light tone. This book is nothing less than essential for today’s working web designer. Oh, and did I mention the 2nd edition is just around the corner, slated for release in May 2009? The book is split into two sections: the first reviews markup and creative methods of implementation, the second delves into CSS and solves many of the issues facing the modern CSS designer. I’ve got over ten years of experience in the web design field, and I was simply amazed at some of the practical solutions to problems that I had faced. Covering the essentials, from lists, headings, tables and forms, to expanding their usage through markup minimization and the application of Microformats, Web Standards Solutions contains inventive methods that are not only web standards compliant, but will save you time in your day to day projects. One of my favorite chapters was the one covering anchors. Countless times I’ve used semantically meaningless empty anchors to have the user jump lower in an HTML page. This solution seems almost rudimentary, but gives meaning to my markup. Its really almost comical how many decisions you make while coding without stopping to consider the implications when working a full-time job. Another favorite that I put into immediate practice over at NESN.com was the chapter on tables, and the relations we can establish between data. Taking the knowledge I took from Dan’s review of table markup, I combined it with the hCalendar chapter from my Microformats book and built the team calendars on NESN.com. Check out the Red Sox schedule as an example. The second section of the book covers practical usage of CSS. The one chapter I have referred to frequently is the section on building CSS layouts. Cederholm breaks down CSS layout into four distinct methods, communicated in their most simplistic format, to ease the learning curve and also simplify the transition of using them as skeletons for your site designs. Another technique I’ve pulled from this book is the “faux columns” created by repeating a background image vertically. I’ve used this on just about all my sites I’ve designed since reading the book, and would recommend the investment so you can do the same. The fact that Web Standards Solutions: The Markup and Style Handbook is an essential piece of the web designer’s arsenal is undeniable. I have a personal connection to the book, as Dan makes reference to and uses in some of the book’s examples the Boston Red Sox, and their path to the title in 2004, when the 1st edition was originally published. Being from the Boston area and working for NESN I definitely found the examples delightful. Also going to Endicott college in Beverly, MA, I spent a good amount of time in Salem, where Dan’s SimpleBits studio is located. 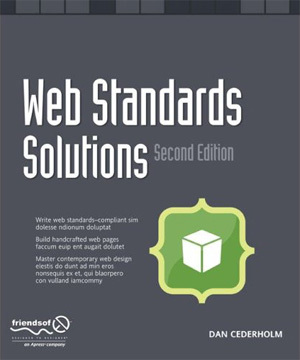 The second edition of Web Standards Solutions is set for release in May, 2009. You can purchase Web Standards Solutions over at Amazon.com. This entry was posted in Book Reviews, CSS, Web Standards and tagged Book Reviews, CSS, Dan Cederholm, Designing with Web Standards, Jeffrey Zeldman, The Markup and Style Handbook, Web Standards, Web Standards Solutions on February 22, 2009 by Jeff Pelletier. Sometimes it’s just as easy as getting out of your chair and hopping around like a weirdo. How can we keep creativity around? Is it possible to call up at any point? Between being a web designer at work and a musician at home. How do I balance the need to stay creative? I believe that it is possible to be creative at any point in time, even when you feel all is lost and you cannot make one more brush stroke or hum one more tune. Here I’ll offer up a few tips on staying creative. Add some music to change your mood. If you’re already listening to music, change the tune or listen to a different genre. One good way to go about changing your mood with music is listening to the ol’ iPod on shuffle. The idea here is to get your mind off of whatever is distracting it. Lets get back to that quote about hopping around like a weirdo. My favorite way to get out of any negative feelings that are holding me back from my work is to get out of my chair and go for a lap around my building. I usually skip at some point on this walk. Yes, I may look like an idiot, but who really cares? It makes me laugh at myself uncontrollably. Laughing enough that by the time I get back to my desk, I’m ready to go with a clear head and clear mind. Figure out what gets your mind going creatively when you are at your peak and surround yourself with it. Is it a certain painting? A lucky penny? Calling a good friend for a laugh? Whatever it is, keep it around when you are working. Don’t forget about this great article over at A List Apart titled “Staying Motivated“, which I have pinned to the wall right next to my desk at work. This entry was posted in Creativity and tagged Creativity, Inspiration on December 18, 2008 by Jeff Pelletier. I’ve read a lot of articles and a few books that detail various methods for web designers to split up their CSS files. Authors have recommended splitting your CSS files to include individual CSS files for fonts, another for colors, another for structure, and the list goes on and on. The WordPress default theme comes with a CSS file that has tons of duplicate declarations. The other problem that just gets under my skin is having duplicate CSS declarations. I hate going through a CSS file to find that I have 3 different declarations for my h3 tags; one that sets the font-size, another that defines the margins and a third that sets it as an inline element. Again, I know this can’t be avioded and is even beneficial in some cases, but the majority of the time I find myself combining as many declarations as possible simply for clarity’s sake. The entire theory behind splitting your CSS files based on fonts, colors, etc. is based upon this duplication of CSS declarations, and I for one think its rubbish. The smaller our files are the better, right? I personally like to split my CSS files out of necessity, not practicallity. Rather than loading up one main site CSS file with a bunch of Internet Explorer X-specific hacks, I would much prefer to stick them in an IE6 or IE7-only CSS file. This serves a few purposes. If you place your IE6 or IE7 style sheet references in conditional comments, like this we do on this page (check your source! ), they don’t get read by smart browsers. So you’re not feeding excessive and unnecessary code to new, standards-compliant browsers. Second, it makes it really, really easy to drop support for an older browser once its no longer needed. For example, what happens when IE8 is released (we’re waiting) and we can safely remove support for IE6? First, we’re throwing a party. And not just because we don’t have to test in IE6 any more, but more because to drop support all we had to do was change one line of code rather than digging through all our CSS to find the old hacks. We may even start the party first, and then drop support for IE6 for all our sites in a total time span of 5 minutes, after having a few cocktails, just to prove once and for all how easy it is, and why this is the only reason you should ever split your CSS. Molly Holzschlag wrote an article a while back that details the different ways you can setup your CSS files to cater to different browsers via @import and the like. Check it out at the Peachpit site. If you’re going to split your CSS into separate files, make sure its for the right reason. This entry was posted in CSS, SEO, Site Architecture and tagged css background images, css declarations, css file architecture, css hacks, http requests, ie hacks on December 7, 2008 by Jeff Pelletier.